“You know you got to give me some of those greens,” he said. How bold. This guy had just shown up at our door to fix a problem with our internet connection, and these were his first words. Our garden is in the front yard right by where he’d parked. 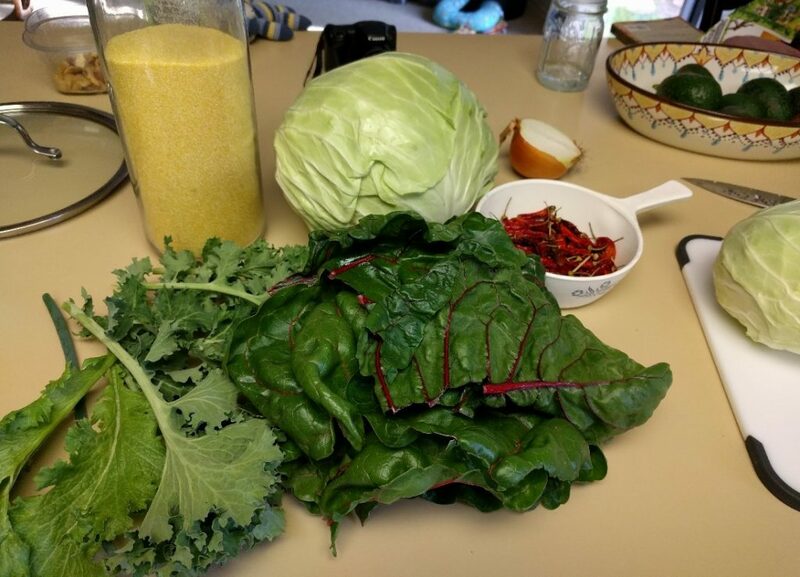 I let him get to work, and I happily walked out and harvested collards, chard, and kale. Moroho is sentimental and nostalgic for me. 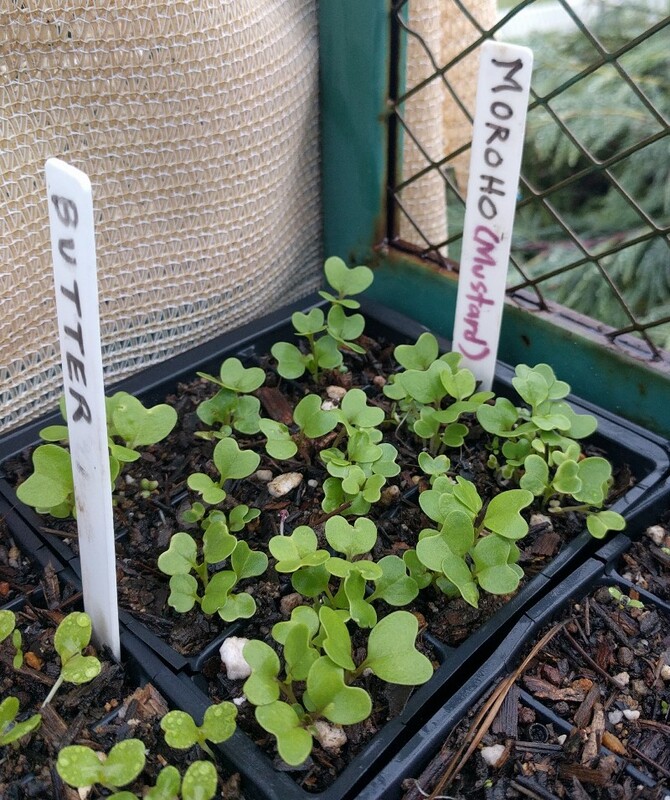 Moroho is the word for greens in Lesotho, the small country in Africa where my wife and I met, where we both were living as Peace Corps teachers, and where we ate moroho almost every day. It’s much more than just another vegetable. Maybe you are one of the few others around here who eats greens and who therefore would love to have it coming straight out of the garden. It’s the only way. 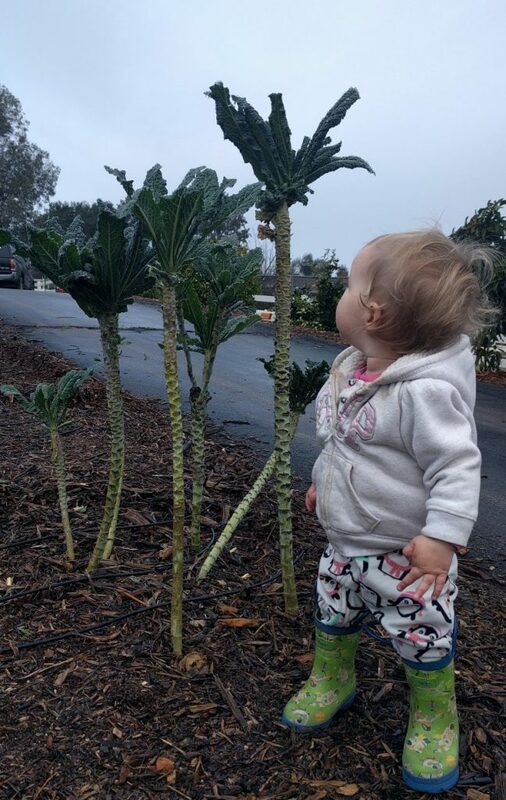 While I learned to grow greens in Lesotho, I’ve been growing them back home in Southern California for about ten years now. 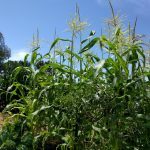 In Lesotho greens grew best in the summer, but in Southern California greens grow best in winter, plus the cooler periods of fall and spring. They suffer if you ask them to grow during the heat of summer, unless you live in the marine layer right on the beach. My greens are so happy right now, in the rainy, mild weather of mid-January. This is the prime of their life. They taste sweet and stand tall. In summer, they don’t taste as good, they’re constantly wilting no matter how much water you give them, and they often go to flower fast — if you live inland like me; I’m twenty miles from the beach. I start sowing seeds of greens in August or September, continuing through fall, through winter, into spring, stopping by May. At that point, whatever plants I have in the garden I care for as far into summer as they’ll allow (how long will June gloom last this year? ), but I don’t sow or plant new greens again until at least August. Every year’s a bit different, but that’s the general pattern that I’ve found successful in gardens from two to twenty miles from the beach in Southern California. Cabbage is an exception here. I include cabbage in the greens category. But only sow it between August and about October. That means you can plant seedlings from September through about January. 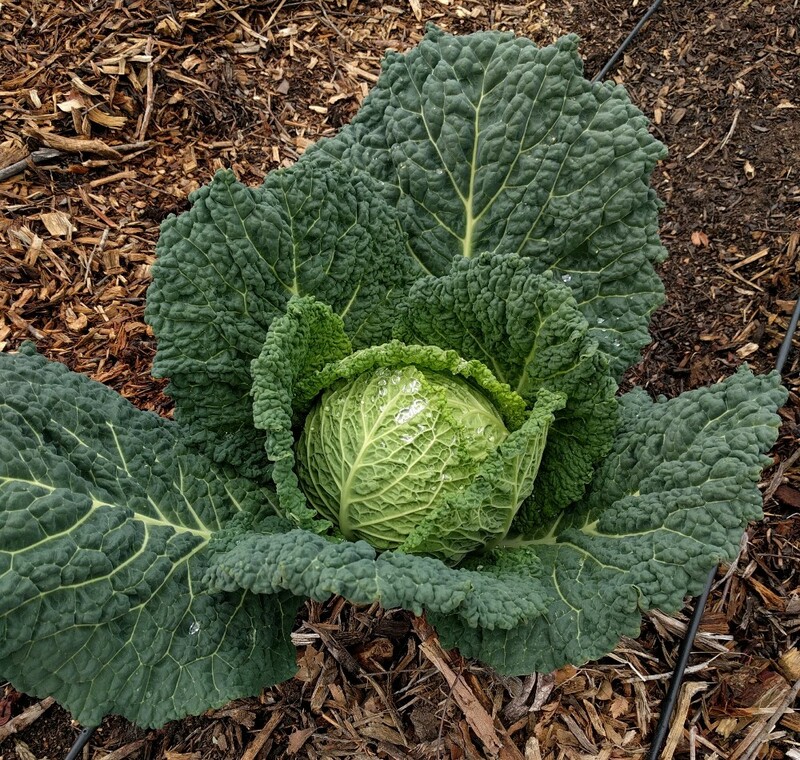 Cabbage is slow growing so if you plant later, you’ll likely deal with lots of aphids, the plant will form only a small head, and it will not taste as sweet as you hope. 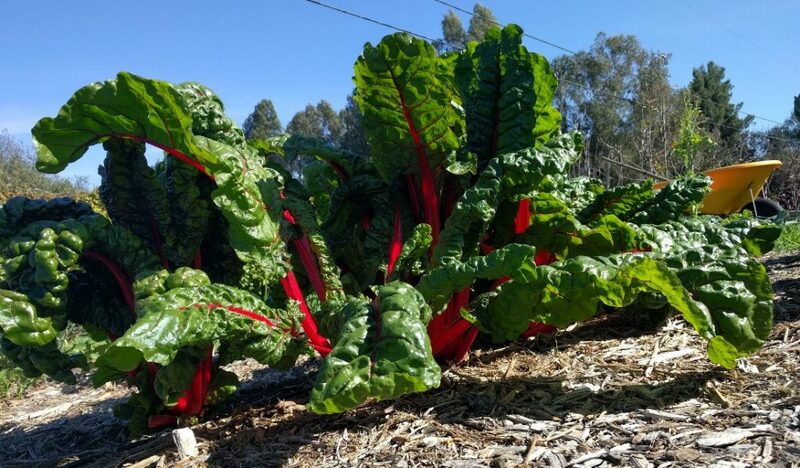 I’ve found chard to be the most tolerant green to our summer warmth. I’ve grown it all the way through the summer occasionally. But usually I just switch to eating sweet potato greens during the heat of the summer. 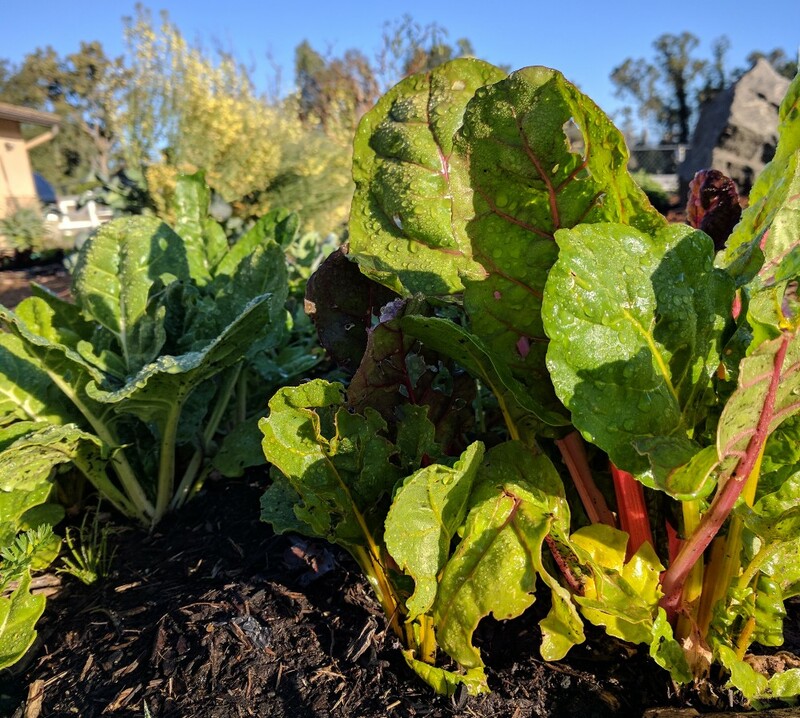 Even though chard will tolerate heat, sweet potato greens adore it. I haven’t met a type of green that doesn’t grow well here or that I don’t love to eat, as long as it’s grown in the right season. 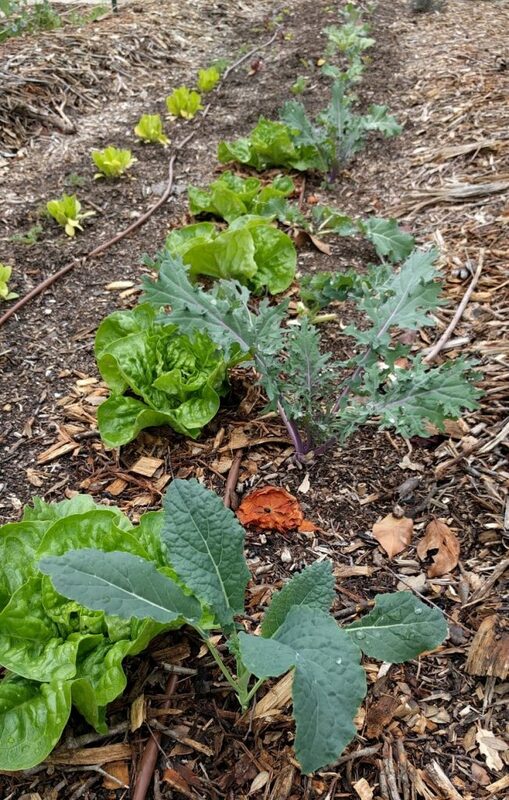 The types I’ve grown include kale and chard and collards, plus mustard, spinach, turnip greens, cabbage, choy, and more. 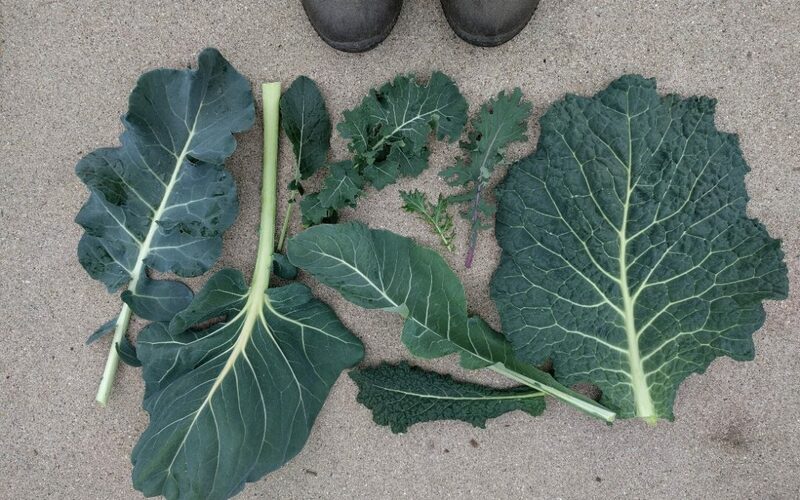 A couple of favorites are ‘Dwarf Blue Curled’ kale and ‘Bright Lights’ chard, plus any and all collards. 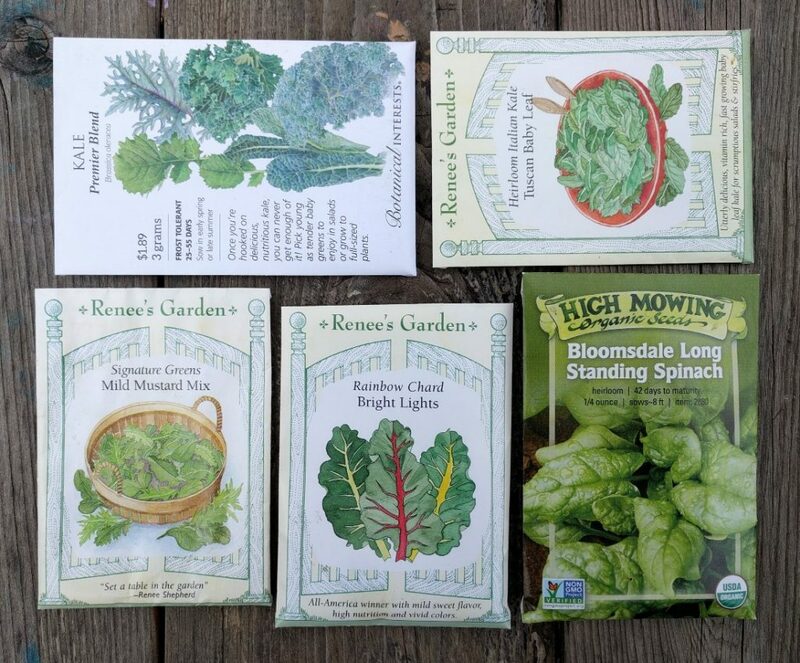 Some varieties of greens I’ve been growing this winter. But I always plant a mixture because that’s how I like to eat it. 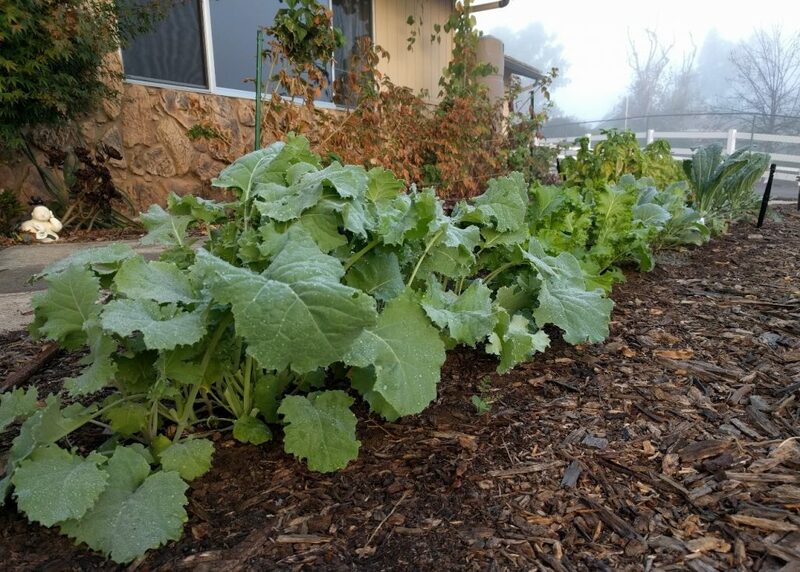 I grow mostly sweet stuff like kale, collards and cabbage, and then a little spicy or bitter stuff like mustard and chard. That combination and proportion tastes best to me. Ready to be planted out. 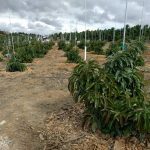 After young plants have been thinned, you end up with individual plants spaced at least a hand’s width apart, now able to stretch and grow larger. 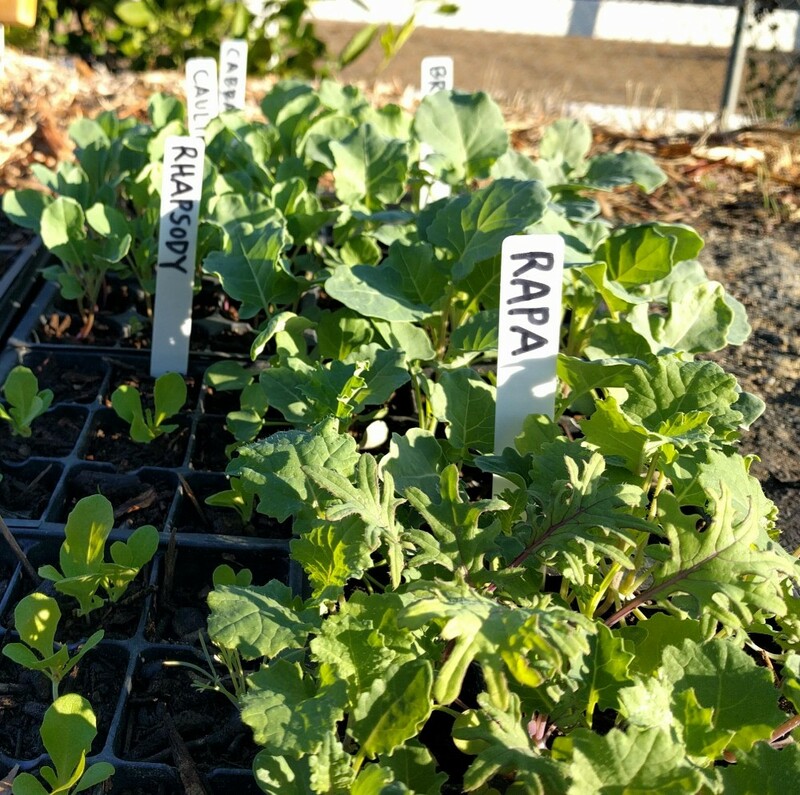 Final spacing on some kale growing beside butter lettuce. The spacing always depends somewhat on which type of greens we’re talking about. 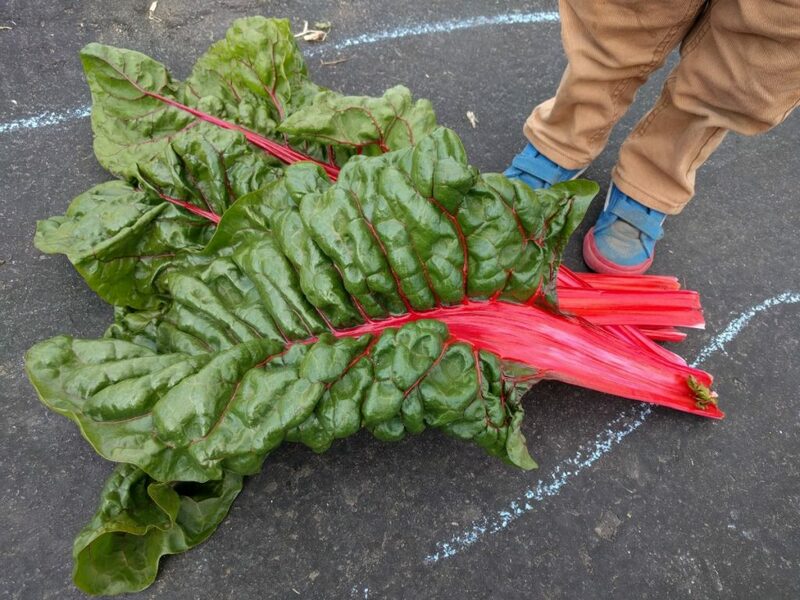 Chard gets much larger than kale, for instance, and so it needs more space. These young chard plants need to be thinned. Too crowded. Greens don’t need much more or less water than any other vegetable. In the fall and spring, I water my greens mostly with drip lines, but it’s good to occasionally wash off their leaves. When you do you often knock off some pests, like aphids or bagrada bugs. Don’t be afraid to spray the plants with a hard jet of water to blast these insects off leaves. It won’t hurt the plant, and it disrupts the pests. Aphids and bagrada bugs are the main ones I’ve dealt with. And my main weapon is blasting them with water. You’ll find that these pests have a season. They’re not around all year. Don’t give up on plants that harbor a few. 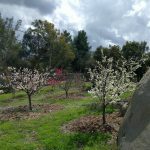 If you do some water blasting and you don’t spray pesticides, then predatory insects and birds will do some control, the weather will change, and in time the pests will, as if magically, vanish. Happens every year. Also, some years are just worse than others. Last year I had tons of aphids. This year I have almost none. Usually, their population is highest in March regardless. I like to keep some mulch beneath my plants. 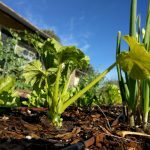 Rough compost or wood chips work well. This makes it easier come harvest time, when there’s often no washing necessary because no soil has splashed up onto the leaves’ undersides. You never need to harvest a whole greens plant. You pick outer, lower leaves and the plant keeps growing new ones from the center. Just be sure to leave a couple leaves in that central part of the plant and it will continue to grow well. After some months, the weather will warm and the plant may shoot up to produce a flower stalk: “bolting” it’s called. And it’s natural. The leaves start to taste bitter at this time. Leave the flowers if you don’t need the space because bees and other insects that are helpful to your garden feed on them. By the way, you can use this method of picking outer leaves with cabbage too. I always do. 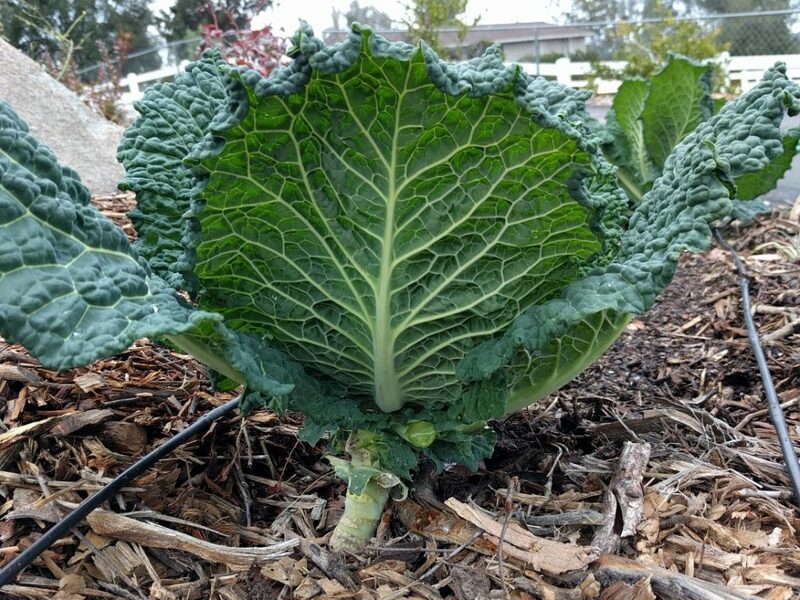 This way, you get to eat cabbage leaves for the couple months before the plant finally provides a head. Been picking outer leaves off this savoy cabbage plant periodically. Nonetheless, it is still forming a fine head. Want to get really down to earth? Expand your definition of greens. Include leaves from broccoli and cauliflower plants. They taste very similar to kale and collards. 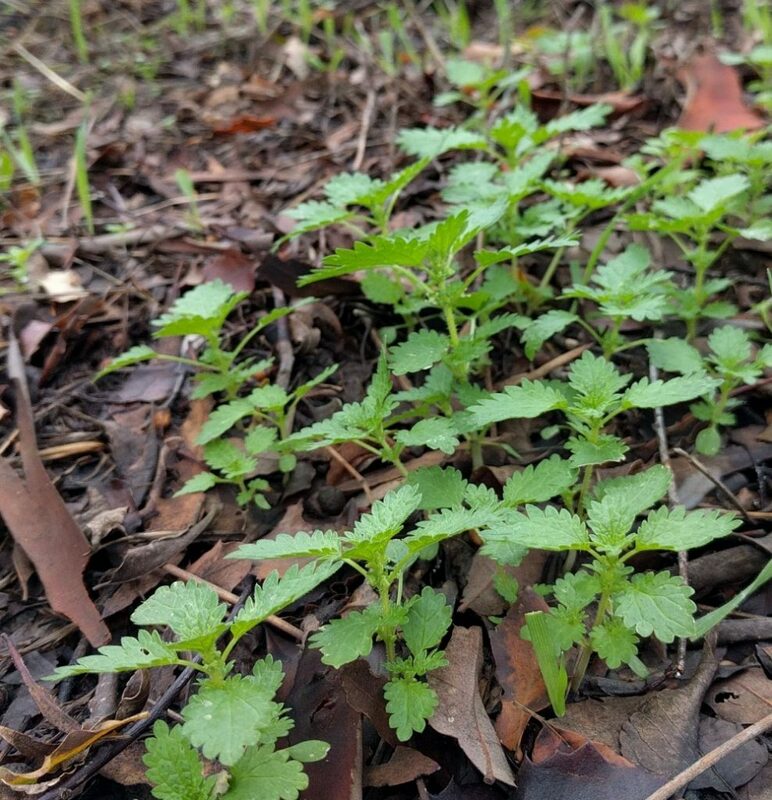 Or poke about the weedy corners of your yard, or take a hike in the hills, and you’ll find delicious wild greens growing in winter to add to the ones in your garden. 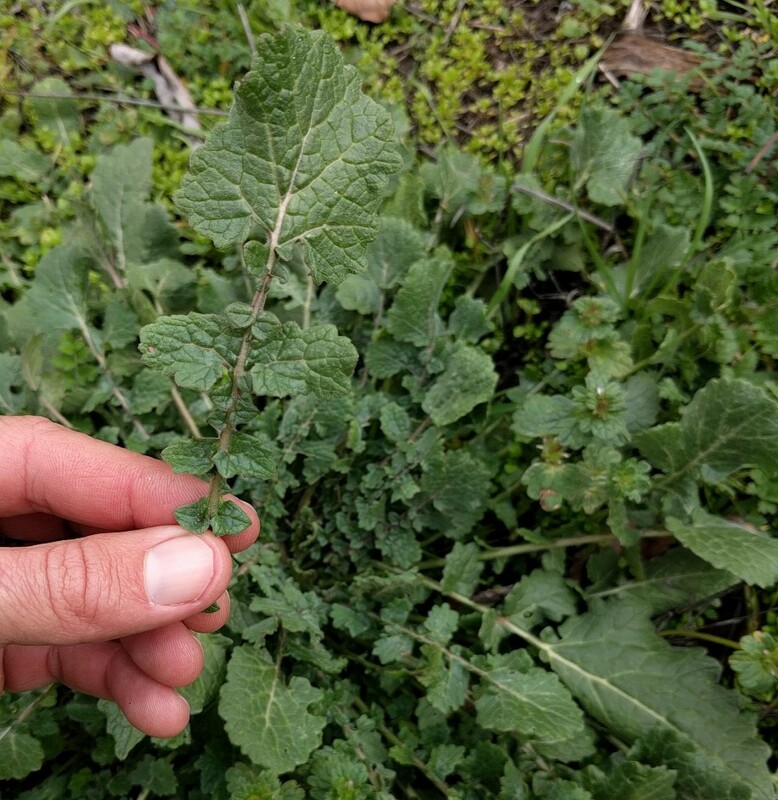 I didn’t add any unconventional or wild greens to the bag I harvested for that visiting technician, but yesterday I picked some of that wild mustard and nettle to add to our own dinner greens. I learned to pick various wild greens in Lesotho. Guess I learned almost everything I know about greens during my years there. Papa ka moroho le boroso. 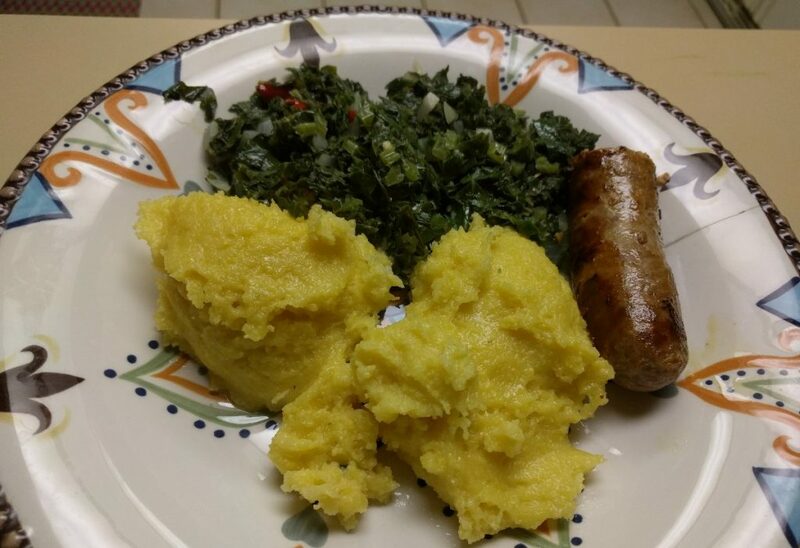 Maize porridge with greens and sausage. I don’t imagine it looks enticing to you, but you get used to it over the years. And eventually, you got to have some. Great post! Thanks for the request answered! 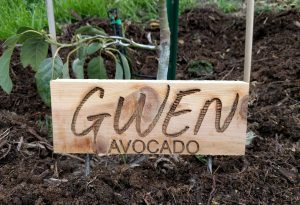 Be sure to apply to own garden! Thanks for requesting this one, Shalom. I may have never written it otherwise. Had no idea it would be useful to many people. Eish! I haven’t heard of moroho for many years and then to serve it with pap and wors! The best. My greens are growing wonderfully especially after all this rains. Wow, Nohline! You know the good stuff! I can tell you speak from experience. I was reading an article in a Costco magazine that described how they are growing lettuce and others in hot houses. I was impressed with the hydroponics and methods they use to avoid bugs and insecticides and produce all year long. Also, it seems those leafy veggies don’t have mud and dirt on the leaves. What do you think about this? Growing in greenhouses and similar structures certainly has advantages, mostly in being able to modify temperature and humidity. It does allow some prevention of pest issues too, but it can also magnify some others. I say all this just based on observation of friends’ greenhouses and listening to farmers talk though. I’ve never grown in a greenhouse myself. With regard to hydroponics, it’s amazing what people can do with it. A friend grew strawberries hydroponically last year and they were perfectly clean, tasted great, and had zero bug damage (even though they were grown in an outdoor hydroponics set up). That being said, because of my rudimentary understanding of the soil food web, I’m skeptical that hydroponic berries and vegetables are as nutritious as those grown in soil. Thank you for the kind words and the feedback. I am often unsure of whether I’m bogging down a post with too many photos. Now I know that, at least in this case, I wasn’t. Thanks Greg! I passed through Lesotho once with a group and being a vegetarian, my hosts were so worried what to feed me. I feasted on greens and papas. Still remember the sweetness of those greens, grown in “back door” gardens. Thanks for reminding me. I’ve been putting off eating my chard but I think I’ll head out back now and clip a few for scrambled eggs with garlic! Love this! Brings back so many memories. Chard was the main green I grew in Lesotho (which they called “spinach” incidentally), and whenever I found eggs to buy I’d always scramble them and add some of my chilipeppers and chard in there. So good! Greg, what a wonderful post! Never enough pictures in my opinion and yours are really good. Question: have you ever grown iceberg lettuce? Mine have not headed up and I can’t find a lot of info. Thanks! Thank you, Judith. I’m not growing iceberg lettuce this year, but I love the crunch of iceberg and I have grown it in the past. My best iceberg crops have come from early fall plantings that mature in late fall or very early winter. The only problems I’ve had with iceburg is bugs getting into the heads because they’re not as tightly wrapped as, say, a head of some kinds of cabbage. So sometimes I’ve had to wash out a few earwigs, for example. One thing to watch out for is harvest time. Don’t wait too long. Don’t wait for the head to look really big. Once it forms a head, poke it with your finger and if it feels dense, harvest it. If it still feels loose, let it grow a little longer. Especially be watchful in times like now where there’s a warm spell during the winter. Cool season crops like lettuce can mature fast and they also need to remain well watered.